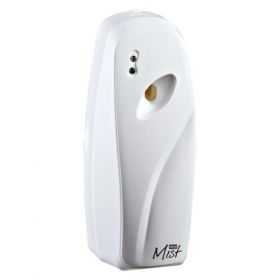 The Ona Mist Dispenser has an electronic eye that senses bright light or low light. You can set it to spray only in the dark (low light) or during the day (or when lights are normally on). The third option allows you to set it to spray 24 hours per day. The spray is metered out in three adjustable time intervals - 7.5 minutes, 15 minutes, or 30 minutes. Operating on batteries, the Ona Mist Dispenser can be placed anywhere.